YOU could argue there has been two boom horses of 2017 - so it’s any wonder Wingrove Park are shouting from the rooftops their close ties to Royal Symphony and Jonker as the year comes to a close - with both horses expected to make an even bigger name for themselves in 2018. While it may have been well documented that Wingrove Park bred Royal Symphony (Domesday x Naturalist), the desperately unlucky fourth placegetter of the Caulfield Guineas and W.S. Cox Plate, what may not be as well known is the Kerried-based breeders link to Jonker (Spirit of Boom x Hearts and Arrows), the undefeated $2 million Magic Millions 2YO Classic race favourite. The David Atkins trained colt has been breathtaking in his two wins in the month of December after a nine-length trial win got people talking a few weeks earlier. A $45,000 purchase from the 2017 Magic Millions sale, Jonker is part of the first crop of Queensland sire Spirit of Boom. Jonker is the first foal to race from the 11-year-old mare Hearts and Arrows (Kempinsky x Villa Igea) who was bred by Wingrove Park on 18 September, 2006. Wingrove Park raced Hearts and Arrows with Mick Kent to win her first two races at Cranbourne before injury curtailed her career at her third run and was subsequently sold. “Hearts and Arrows was a highly talented race mare that we had high hopes for and possessed plenty of potential – it’s no surprise with her pedigree page to see her make her mark in the breeding barn,” Wingrove Park CEO Joseph Vella explained. Hearts and Arrows is the eighth of 13 foals from the dual winner Villa Igea (Papal Power x Wycombe). Villa Igea, now retired from stud duties, produced eight individual winners who collectively won 38 races and over $1.3 million in stakes earnings. Hearts and Arrows is a half-sister to stakes winners and Hong Kong champion Fair Trade (by Danewin), dual metropolitan winner In Fairness (by Denman) and 11x winner Portal (by Octagonal) and 7x winner Count the Diamonds (by Viscount). 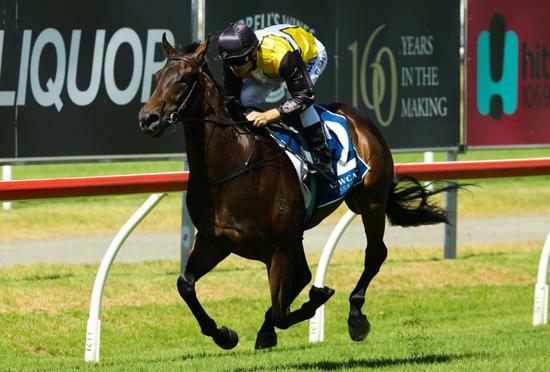 “Villa Igea has been a top-class broodmare over a sustained period with her daughters already producing a 100$ strike-rate to winners with Jonker one of four winners,” Vella explained. Two daughters of Irreversible (by Last Tycoon) in Stately Lady (by Skilled) and Miss Octette (by Octagonal) have been succesfull on the racetrack as has Lillybeth (by Kaphero) who hails from Fair Honour (by Kempinsky). Three progeny of Villa Igea continue to kick goals on the racetrack with In Fairness (by Denman) a dual city winner, Her Command (by Commands) a dual winner and highly sought broodmare type as well as Fiscal Fantasy (by Skilled) having recently made it back-to-back wins. It is no surprise to see the Villa Igea family kicking goals with the dams family dating back to Cothele House and Eight Carat family (dam of 5 individual Group 1 winners). Wingrove Park wish David Atkins and conections the best of luck on January 13 for the $2 million Magic Millions 2YO Classic.